Jump in with both feet and go on an adventure with Richard Salas and experience the underside of the Pacific Islands of the Americas. Watch as 22-foot whale sharks swim gingerly along, slurping up microscopic plankton to fill their enormous bellies. Get up close and personal with massive bait-balls of big-eyed scad as they swirl in the afternoon heat while being dive-bombed by jack mackerel in a ravenous feeding frenzy. And experience 700 pound sea lions frolicking under a noonday sun. The Sea of Light Collection, a 3 book underwater classic from the Equator to Alaska is 4,200 miles of underwater photographs. Richard says “I am a human being in love with my fellow water beings, and as I visit their world and record bits and pieces of their lives, I feel honored. I am the uninvited guest dropping in on their day-to-day lives, the neoprene-clad invader.” As Tim Means (owner and founder of Baja Expeditions) puts it, Richard’s work is not a document of “…alien invertebrates or scientific specimens, but portraits – windows into personalities. 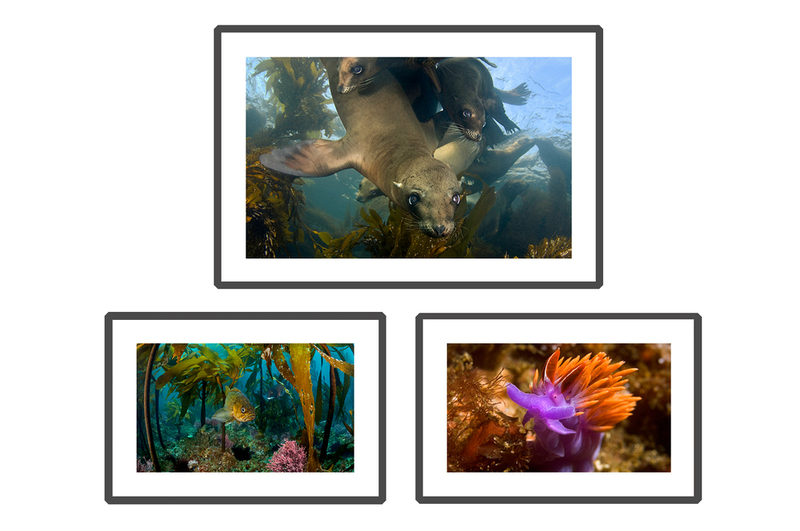 Illuminated as equal beings, his subjects return the camera’s gaze with surprising wonder and curiosity, and when we come face to face with these distant relatives - what Richard calls our 'underwater family' - a profound connection takes place."